Jeff Gilbert has been selling his Hot Chili design for several years now here on Duckworks. At least two have been built and I have heard of a 3rd or 4rth that were at least started. Chuck tells me that a lot of the plans have been sold so there may be more out there. I, Paul Moffitt, got involved with his designs through my father, Bill Moffitt, back in 2003ish. I was at the point where I had access to my own fully equipped wood shop at Swarthmore College where I was the Technical Director. I decided it was time to build my second boat. (the first one was a “learning experience” = code for I made a banana.) Jeff comes and goes like the east wind, and back then he was tearing through ideas and design concepts. He sent me copies of the Roonio design and I fell in love. I asked if I could be the prototype builder and he agreed, giving me the plans for free. I proceeded to build what was to be Jeff’s very first build of one of his designs. Before any of his Hot Chilis were built I built the first, and so far only, Roonio. Which I have named Serendipity and you can find links to articles featuring my build and adventures on the sidebar. This is Jeff’s discription of the boat. design rig comprises 2 x 40 sq foot home-built sails on revolving masts in any of 4 mast positions. Being reversible, the yacht can be shunted or tacked. Steered by weight shifting or paddle, Roonio is sailed from an 8 x 4-foot Bridgedeck made of a strengthened single ply sheet. 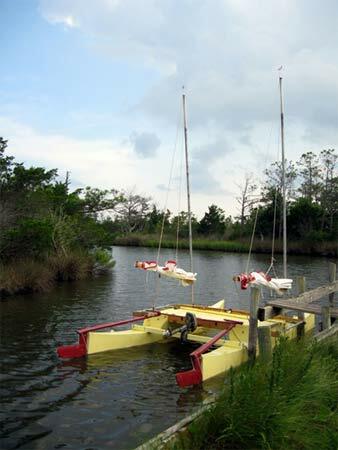 Asymmetric hulls limit lee drift by the flat outer hull sides combined with the bottoms extended inboard to form vortex boards. The boat requires no reconstruction, but rather the addition of foils to convert to a more recognizable, common house-trained cat. Standard kick-up rudders purpose built or filched from a less pristine beastie will put steering on a more proven footing. And those who crave maximal windward ability can temporarily sacrifice the 5¼”sailing draft by using a single dagger board to windward or leeward since the boat is reversible. This dagger can go through the bridgedeck and one vortex wing if using the forrd biplane rig configuration, but would have to be well aft if sailing as a schooner-proa with both masts in one hull. 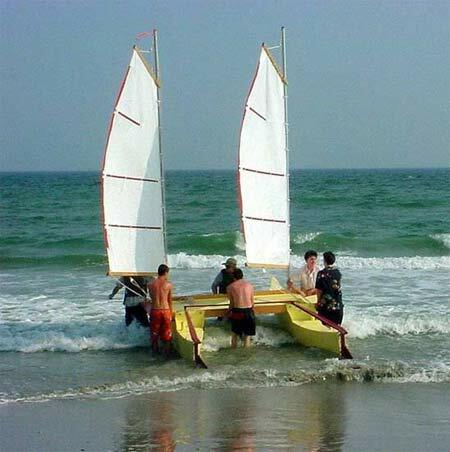 This could best be achieved by adding daggerboard rungs to the outer side of one hull. In other words, the more performance one wants from this boat, the more work needs to expended in adding tuned foils and their support infrastructure, and the less flexible the boat becomes. In its most complex form, as a proa with a kick-up rudder either end and a dagger or two to shift, you would probably need two to shunt it quickly. On a day or weekend sail I’d take it out with a simple biplane rig, a steering paddle and no daggerboards, and a small 2 HP outboard motor with a full tank. Not optimal, but simple and safe, and if you had a destination in mind, if there was a mild time constraint, Id motor to gain leeway or beat a calm. As a boat like this reaches and runs so very fast, I wouldn’t be starting a motor under any other circumstances, hence one couldn’t use much gas. If its calm the long steering paddle/oar can be used as a sweep. A lot of leverage can be gained by using the paddle thru a hole in the bridgedeck rear rail, and one would sail with sheets in one hand and paddle in the other. Loping along on a easy reach I’d thread the sheet tail(s) thru a hole in the paddle handle, so that you could free a hand by pulling the sheet(s) up thru the handle and twisting 180deg to lock them off temporarily. Much more on rigging follows. Roonio is designed for ease of construction & robustness more than low weight. To make this boat really light would involve a complex system of frames and a vulnerable fabric not in tune with the intended use or build effort. Thus though it is car-toppable with the hulls laying flat on their sides within the outer Bridgedeck rails, it will be a job to unload hulls alone. The boat is designed to perform best with a crew of two anyway, but those who choose to sail solo may prefer to lash the Bridgedeck on a standard car trailer to simplify assembly and launching. The sails I made are 60 square feet each. I also plan on making new sails with a bit of belly in them in the next winter season in the hope of point even higher into the wind. I added a permanent lee board to the Starboard side of the boat, not through the bridge deck. I actually us a lee board from my fathers Family Skiff. I have found that I get .5 knots extra with it down while pointing any where close to the wind, also I am about to point an additional 10 degrees higher into the wind. But I love having it up and being able to sail into the wind in 6 inches of water. It takes me places no other boat can with its vortex panels. I added permanent hiking seats to the outside which you can find pictures of in my other articles. They make sailing this boat very comfy and relaxing with a stadium chair. I took out the back two mast mounts after a couple of seasons and now only sail it in bi plane formation. I have never tried sailing it with just an oar and shifting my weight. I made a bridge deck tent. It is 4x9 and gives me the biggest tent I have ever had. So here are some performance things with the boat. It is fast. Going wing and wing down wind I have hit 8 knots. Sailing in bi-plane formation takes some practice. I didn’t get the hang of it until the third summer. Now that I know how to do it I could easily teach someone else what to do with a simple email. IT takes some finesse but the basics are that you need to spill wind from the windward sail and pull in tighter with the Lee sail. You need to invasion both of the sails as one wing and you start to get it. Once you do get it your pointing ability is better and the speed picks up, which allows you to point a little higher. Then you need to adjust the sails ever so slightly more. You almost need to ride into the wind slowly picking up speed while pointing higher as you generate your own wind. But you have two sheets to deal with. That’s why it is better to have to sets of hands. With the 4x8 bridge deck it is plenty big enough for two sailors and a dog. There is enough storage so that in the last OBX I took her on I had fishing equipment, beach tent and gear, tools, food and water for a week, and about 60 cans of cold beer. Not to mention some clothes and 2 gallons of whiskey. Getting the stuff into and out of the hulls is the only thing that can be hard. That’s one of the main reasons I took out the rear mast steps. I put twist lock hatches in from Duckworks and now it is much easier to unpack and pack. So on the OBX130 anything with a draft of over 1’ would be well advised to stay in the shipping channel. 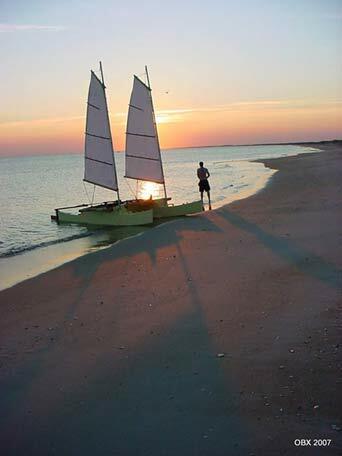 But with this boat I am able to cut off to the Port side going down to cape lookout from cedar island and make my trip much shorter. The Lee Board is up for most of the time but depending on the wind it doesn’t matter, especially with all the time saved not sailing all those extra miles. Below you will find links to article’s I have written featuring Roonio. The drawings themselves are great. Jeff seems to be MIA these days, but if there is something I can try answering I will. Give me a shout. Disclaimer; I am not half as smart as Jeff and I did not design the boat.